The LyoS 2.0 control system software is fully configurable and fully validatable for regulated pharmaceutical and biotechnology applications. 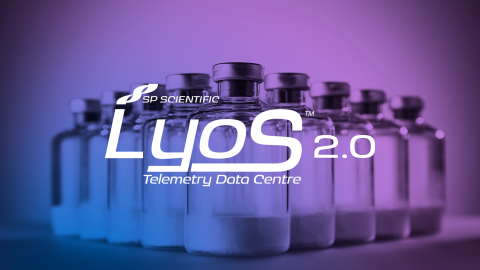 SP Scientific has launched LyoS 2.0 – a line-of-sight enabled lyophilizer control system able to control platforms from development to production units, making cycle transfer and scale-up much simpler. The LyoS 2.0 control system delivers unmatched process control for all stages of the cycle, from freezing to primary and secondary drying. User definable process alarms protect the user's valuable product and automated system tests to ensure the lyophilizer is running optimally. In addition, the control system is designed to control proprietary SP Scientific freeze drying technologies including ControLyo ice nucleation, SMART automatic cycle development and LyoFlux TDLAS continuous process monitoring. Designed for SP Scientific's research, development, and production lyophilizers, including the LyoCapsule, LyoStar, Genesis, Ultra and LyoConstellation. LyoS 2.0 and SP Line of Sight technologies can be upgraded on to certain other freeze dryers.